Please call owner Scott at 715-673-4919 or 715-495-0982. Boat is in Nelson, Wisconsin. Overview: If you're looking for a tournament ready Bass Boat, this 2008 Triton TR21X HP/SC is for you, it is a very fast boat, steers like a dream and smooth on the water. Features: Boat comes with hydraulic steering, pro trim, hot foot, 2 stroke oil injection, Minn Kota Fortrex 36V 112 Ib trolling motor W/universal sonar, (3) SRM-29/675 CCA Interstate Deep Cycle trolling motor batteries, Minn Kota precision MK-460 4 bank 60 amp on board charger, 2 Triton bike seats with pro poles, Hambys keel guard, (2)-12' Minn Kota talons with covers, custom tandem axle bunk trailer with brakes, swing tongue, spare tire, ratchet tie downs, custom Triton cover, Engine Information: 2008 Mercury 250 Pro XS with a 145 hours, comes with engine cover, (1) SRM-29/675 CCA Interstate deep cycle starting battery, 8" manual jack plate, stainless steel 3-Blade Tempest Prop. Instruments: Smart craft gauges, Lowrance HDS10 with DI/SI and GPS at dash with heavy duty ram mount, Lowrance HDS7 with DI/SI and GPS at bow, both of these units are linked, carrying case for both Lowrance unites, structure scan Lss-1. 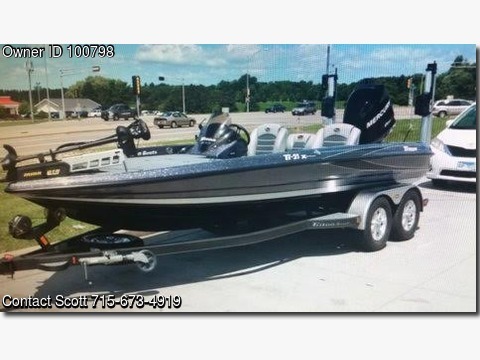 Final Notes: Boat is very clean and in great shape, I love this boat for all of it's storage and great features, selling because I am not currently fishing tournaments anymore, I will miss this boat but it doesn't make sense to have something that isn't being utilized.